The Nest Learning Thermostat is worth every penny of its $250 retail price. Every. Single. Penny. In fact, you’ll probably make that $250 back in the first year after you install it considering all the money you’ll save on your energy bills. 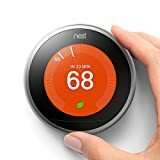 But if you buy a Nest thermostat today on Amazon, you’ll recoup your investment even faster because it’s on sale for $209! Definitely grab one before this deal is done. What kind of monster would pass up this Crock-Pot slow cooker for under $19?